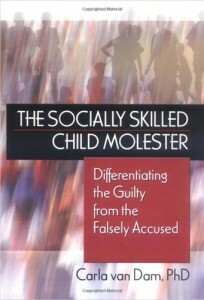 The Socially Skilled Child Molester: Differentiating the Guilty from the Falsely Accused | Carla van Dam, Ph.D. Revealing the secret but successful strategies used by child molesters allows adults to intervene long before children are abused. The Socially Skilled Child Molester: Differentiating the Guilty from the Falsely Accused identifies how socially proficient molesters successfully ingratiate themselves into families and communities. The book closely examines their techniques and strategies while detailing the tools for prevention. The difficult issue of false accusation is tackled by learning the distinctions that clearly differentiate the actions of the guilty from those who are innocent. Practical recommendations for accurately assessing danger and managing safety are provided. The Socially Skilled Child Molester focuses on the sexual deviants who ‘groom’ family, friends, and their community to allow their activities, though arousing suspicion, to go on without restriction. This essential source reveals their tactics. Using composite representations of various types of child molesters, the author illustrates through case history and detailed research how these offenders succeed, while providing recommendations on how communities can stop enabling and protecting such individuals. recidivism for the sexual deviant. The Socially Skilled Child Molester comprehensively brings together helpful strategies and vital information essential for parents, lawmakers, police, teachers, and therapists.